Planet Hell: Now Playing - "Jason sans les Argonauts"
Here's what I've been playing this week, more of the same, still slugging through 3 RPGs, as always it seems. I'm really enjoying all 3 though, so perhaps 'slugging' isn't the word I am looking for. 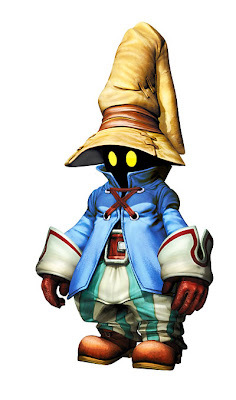 Final Fantasy IX (PS1) - I progressed a bit further into disc 3, where the mysteries of the story start to unravel. Things are starting to get interesting, as I have a lot of good abilities and equipment on my characters. They can deal a LOT of damage each turn. Zidane dishes out 3500+ each turn with his normal attacks. And Vivi has some kickass spells-Flare, Comet, the 3rd level elemental spells. I think I'll be able to finish off disc 3 pretty soon. Depending on how long Disc 4 is, I might beat this before the end of the month, but I dunno. Saturday: Onto disc 4 now, and I'm probably going to try and race on with the main story becuase I am quite confident with my levels and gear, but not entirely sure. I've not played through this before, so who knows? There could be a massive difficulty leap on the last disc. Dragon Quest: Hand of the Heavenly Bride (DS) - I started playing this not too long ago, so I had something portable, and I've quickly put in over 10 hours to it. So far it has been very similar to DQIV DS, with lots of religious themes(I think though, that is the case for all DQ games) and charm in abundance. I love the names of a lot of the monsters: Eyepod, Combatterpillar, Moosifer..etc heheh. Some are ridiculous, but kinda awesome. There is something about the Dragon Quest games I really like. They are very old school, simple, but quirky RPGs that are really fun. Of course, they are not going to be for everyone. Some people are really put off by the grindy nature, but I enjoy the combat, especially given that in this one, you can recruit monsters occassionally after battle. That is one thing that could easily add on some depth, and put on a couple extra hours here and there to your play time. 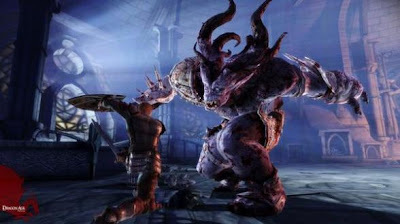 Dragon Age: Origins (360) - I haven't put much time into this since last time because I've been trying to beat FFIX before the end of the month, and any time I am out on the bus or whatever, I've been playing DQV. So although its been on the backburner a bit, I've been trying to progress in the Fade section of the Circle of Magi quest. I'm playing it as a write this actually, I don't particularly like having to fight all these enemies with just my protagonist. Staying alive is quite tricky when they gang up on me. So I've put the difficulty down and I'm seeing how that is gonna affect things. Sunday: I've pretty much been playing this all day today =p Its somehow really addictive at times, its really well written and very compelling. I finished off the Circle of Magi part of the main quest, blitzed through the Shale DLC and now I am going through the Wardens Keep DLC. Good stuff, I really am impressed with the codex and the amount of sidequests. Resident Evil 4 (Wii), Dirge of Cerberus: Final Fantasy VII (PS2), God of War (PS2), Castlevania: Judgement (Wii), Doom (PS1). Those will be secondary to the Final Fantasy games for now though, I still have a bit of IX, X and XII to get through before XIII hits. If I get a bit bored of the games I'm playing, I'll probably stick on one of those short(ish) games. Oh, if you are wondering why I say "Saturday" and "Sunday" above, its because I started writing this on Thursday or Friday, and its kind of an 'as I play' thing. Hmm, I might actually do another diary/blog style review or playthrough of a game, like I did for Dragon Quest IV. I quite like that idea.